Say goodbye to boring and lifeless gray concrete floors! Concrete acid stains offer beautiful dye colors to match your interior design and create a custom flooring look that is uniquely your own. The available color sections make your choices almost endless. The natural tones of acid stain floors can stand up to ultraviolet rays and may even be used to stain stamped concrete for exterior applications. The acid stain flooring systems we use here at AAA Southern States Refinishing utilizes self-leveling concrete in gray or white. We integrate the base with whatever stain color or concrete dye you choose. It is applied to the floor surface and provides the perfect medium to create decorative concrete floors for home or office. We then seal the finished floor with a protective layer that also intensifies the stained concrete color. 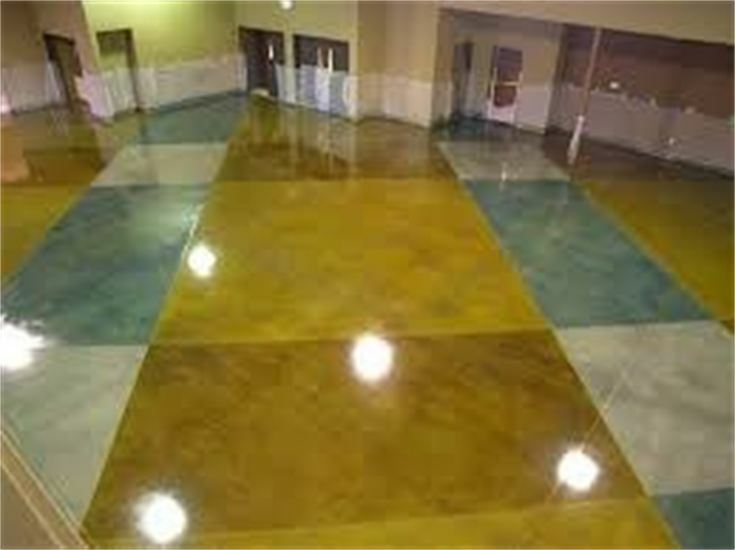 Decorative concrete floors with concrete acid stains and dyes on self-leveling concrete provide an ideal approach for residential and commercial flooring options. The coatings range in thickness from 1/16 to 1/8 of an inch. Generally, we apply 2 to 3 layers and integrate the colors with topical acid staining or dyeing of the concrete itself. The coloring options are pretty much unlimited and may be custom-mixed for just the right colors to match your décor. As displayed in image at right, the decorative surface options are limited only by your imagination. From classic seamless concrete to decorative borders and tiling, you basically have your choice of designs and patterns. Throughout Fulton and Gwinett Counties including Atlanta downtown & suburbs.